CanadaPhysio’s highly trained and experienced health professionals will provide you with comprehensive, personalized care and education aimed at restoring you to optimal wellness. Improving your health and wellbeing has many rewards. 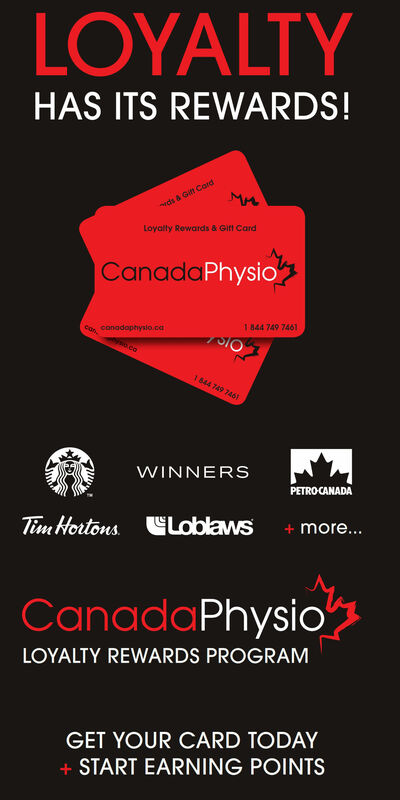 CanadaPhysio Loyalty Rewards is your BONUS ! Use your points to receive discounted or FREE services from our extensive roster of products and services OR redeem your points for valuable gift cards. ...just to name a few ! You will be surprised at how quickly your Reward Points add up to FREE products, services and gifts! 1. Earn Reward Points instantly just by JOINING our Loyalty Program. This is just our way of saying WELCOME! 2. CanadaPhysio loves to celebrate special days. Earn points automatically on your Birthday and other special occasions. 3. Earn points even if your treatment is being paid for by Motor Vehicle Accident Insurance, WSIB, or Extended Health Benefit plans. CanadaPhysio wants to thank YOU for choosing us as your service provider. 4. Accumulate Reward Points every time you attend a CanadaPhysio clinic for treatment, purchase products or gift cards for others. 5. Earn BONUS points when you reach Reward Milestones. 6. Your loyalty card allows you to take advantage of special discounts and promotions throughout the year and earn more points. Reward points are easy to accumulate and even easier to redeem for products, services and valuable gift cards. Your points can also be used to receive discounted or FREE Orthotics, Footwear, Compression Socks, Stockings and Apparel, Exercise & Fitness Equipment, Orthopaedic Bracing and more! Redeem your Reward points for popular FREE gift cards to Starbucks, Cineplex, Walmart, Tim Horton’s, and Gas & Grocery stores to name just a few of our most requested cards. This is our way of saying THANKS to YOU our LOYAL and VALUED customer!